The first time I knowingly heard a piece of music by the Icelandic composer Jóhann Jóhannsson was, of all places, a trailer for the ill-advised and even more painfully executed Battle: Los Angeles. The reason that I can tell you, with such confidence, just how bad that film was - because you'd be right to stare with carp-like vacancy and ask, "Why would you even…" - is entirely Jóhannsson's doing. I don't remember much about the film itself - save for the granite-like quality of Aaron Eckhart's chin and of his acting, or the feelings of apathy and rage they caused, which, though having descended separately, commingled into something like 'aparage' which is not like an aperol spritz at all - but I do remember the feeling of hearing that piece of music for the first time. How the blood in my face drained away and pooled in my feet, seeming to take all the muscle and tissue with it and leaving my bones with nothing to cling to. I remember the moment when that darkling, vocoder-processed refrain joined in with those shimmering strings and sung, "The sun's gone dim and the sky's turned black". And I remember, even in the dark of the theatre, considering for a moment a powerful fear that it might just be true. Such is the power of a carefully-placed piece of music that it can bring meaning even to the most vapid film and when, on those rare occasions it is paired with something of the same depth, the results can be oceanic, numinous, even. Providing a song for a soundtrack, of course, is very different to producing a score created entirely for purpose, via artistic collaboration. And, though the former can be used to great effect when properly deployed, that effect really only becomes something more than the sum of its parts in conjunction with the latter, with Cliff Martinez's Drive and Harry Escott's Shame being two easily-recalled standout examples in recent cinema. Contrasting with Hollywood's penchant for big pop tunes of dubious quality booming out at pivotal moments, which, rather than allowing the viewer to come to their own emotional response, shoves it - fully-formed, the musical equivalent of a square airline-food omelette - down their throat, the most affecting scores are the ones that don't necessarily present themselves. Instead, the ones that resonate most are those that seem as much a part of the on-screen goings on, of the work as a whole, as whatever is happening visually. 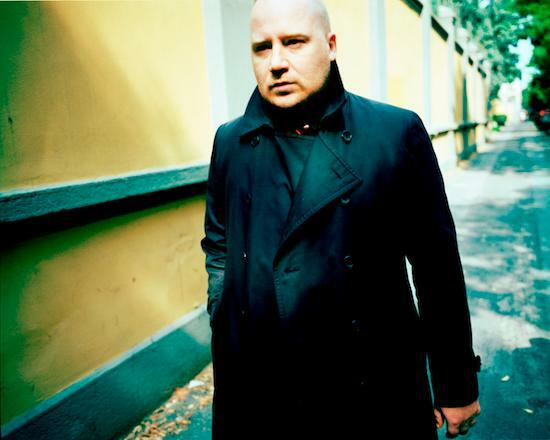 And that brings us back to Jóhannsson who, having scored 2013's Prisoners and 2015's The Theory Of Everything, as well as American film-maker Bill Morrison's 2011 The Miners' Hymns, knows as much about making music for a film as he does about coming together with another artist to create something extraordinary. Growing up in the 90s, we were taught - with as much reverence as is possible to summon from a grainy black and white textbook illustration - about the Industrial Revolution and, living down South, child of an almost entirely politically agnostic family, it's possible I might have been a teenager by the time I'd even heard of the miners' strike. Thinking about it now though, it seems clear that what happened between 1760 and 1840 was something more like the industrial Enlightenment and the events of 1984-85 were the revolution. What I know now, and what Morrison's film - archive footage of the mining industry in Britain, spanning over 100 years, set to the traditional brass band music of those communities the project so beautifully illuminates - makes clear is not just how much has been lost in the face of technological upheaval and political tyranny but also how much can never be taken away. How did you first become involved in the The Miners' Hymns - was it something you had heard about and were immediately interesting in being a part of? Did you have much knowledge of the events? Jóhann Jóhannsson: David Metcalfe of Forma contacted me regarding the idea of participating in an audiovisual project based on the mining culture of the north-east of England. We both felt that Bill Morrison was the right person for the collaboration. Bill and I went several times to the region to research the project, Bill scoured the film archives and I worked with local brass bands and musicians to get a feel for the music and the local brass culture. I'm an old trombone player and the brass band was my first brush with playing music with other people as a teenager in Iceland, so I knew a little bit about the culture of these bands. How do you approach work on something like this - something that's cataclysmically charged with human feeling and history? For some, this is one of the greatest injustices in living memory. JJ: I think it was important for both of us as foreigners to do our research and to get a feel for these places and their history. We were very aware of the need to approach this with a lot of respect for the history and for the emotions that accompany the wounds, which are still raw and have not really fully healed yet. But in a way, we had an advantage, as outsiders, to approach this story on our own terms and filter it through our own experiences. What I was interested in was making a kind of requiem for a lost industry and examining the human aspect of this. Composing the score principally for brass was a moving and, I think, important nod to the heritage of the people that the film actually deals with - was that kind of sympathetic composition important to you? JJ: The brief was always to work with a brass band. I was thrilled by this idea, as I have a strong affinity for brass instruments - my second album on Touch [2004's Virthulegu forsetar] was an hour-long piece for an 11-piece brass band. I researched the British brass band repertoire while writing the piece and the music I was most captivated by were the hymns: those melancholy protestant hymns that were a big part of the colliery bands' songbook. I named the piece after one of those hymns - a secular hymn, in fact, called 'Gresford' written by a former miner, which commemorates the victims of a mining disaster in the 1920s. It's very often performed by the colliery bands of the region and it's a piece that many people know. It's popularly called 'The Miners' Hymn'. Even so, I didn't want to make a pastiche of British brass band music, and the British influences are very much filtered through my own background and my own sensibilities. There's a kind of nobility in the music itself and even in the titles of the tracks on the score, particularly on pieces like 'Industrial and Provident, We Unite to Assist Each Other'. Mixing that in with those prominent swathes of melancholy and desperation seems to be as much a call to arms for preservation as a requiem of sorts for what has already been lost. JJ: The titles of the pieces are all taken from colliery trade union banners, all of which contain slogans and agitprop referring to the miners' struggle, the kind that are paraded during the annual Miners' Gala in Durham, where, still today, all the brass bands of the region congregate and march through the town, ending in a solemn procession into the 1000-year-old Durham Cathedral. Our film ends with images from one such procession into the cathedral and it was kind of a magical moment when we performed the piece live for the first time in the cathedral itself, with those same images flickering on the screen above us. JJ: Obviously, in Durham at the premiere it was very emotional. We played two shows to a packed cathedral and the reactions were strong and very positive. Since then, we have toured with it in Europe and the US, and the reception has been very warm. The piece seems to have a quality which transcends the need to be familiar with the history of the miners' struggle in the UK and the lack of a connection to a history of coal mining. I think the piece has some universal themes of work, history, struggle, commemoration and memory that can apply anywhere. That disconnect is why pieces like The Miners' Hymns are so important - it may have been 30 years since the strike but the workforce, in many ways, remains oppressed and drowning as much now as then. JJ: I think these are eternal themes. Where we once had coalmines, now we have Amazon fulfilment centres, food processing plants and call centres. Coal-mining is a dirty industry and not very beneficial for the environment, but there is a lesson to be taken from the way the miners were able to organise and create better conditions for themselves and to create an entire culture, which included music and painting, such as the Pitmen painters. There is also a lesson to be learned from what happens when the foundation of this culture is suddenly destroyed and the wounds this leaves in the communities involved. JJ: In Iceland there are certainly parallels in terms of the exploitation of natural resources and the disruption of nature in the form of the flooding of vast areas to create hydroelectric dams. We do need electricity, but we also need to restrain the inherently exploitative and ravenous nature of capitalism. There is a lot of resistance to this kind of exploitation in Iceland and hopefully it is having an effect on policy. How does it differ creating music for a project like The Miners' Hymns and a film like The Theory Of Everything? Both are very public and personal stories, both emotionally charged, but very different in a lot of ways. JJ: When it comes to the actual work of writing, the music always comes from the same place whatever the context and whatever the nature of the project. But in terms of the external parameters and the framing of the work, an artist project like The Miners' Hymns and a major film like Theory Of Everything are fundamentally very different beasts. The Miners' Hymns is a collaboration between only two people, Bill Morrison and myself, and the music is as much a catalyst for the film as the film is a catalyst for the music. Most of the music was written before I saw any of Bill's images and he edited the film to my finished music. A film like Theory Of Everything is obviously a much bigger project with more voices and opinions involved, so an important aspect of writing music for large productions like this is navigating through all that and insuring that you keep your own voice and your own musical identity throughout the process. The Miners' Hymns, in contrast, being the product of the collaboration of just two people, so it's a very pure expression. But these are external factors that affect the process of producing the music, but not so much the actual writing. So the projects both involve a similar initial process: I start with a blank slate and the actual writing of the music is always a very pure and instinctive process for me, no matter what the project is. Hawking is a committed socialist and both films are very British stories, and, as you say, very emotionally charged, so there are similarities, even though they are also very different films. But I like to work on very different projects and I don't like to do the same thing twice so I'm quite restless in that way. How emotionally invested do you become in the projects that you work on? JJ: Film is a collaborative medium and the music needs to function as an element of storytelling, so writing film music is in that sense very different from writing a solo album. When I'm writing film music I consider myself a film-maker just as much as a composer - I'm just one part of the team that is creating work, which ideally will come close to becoming something akin to art. But I'm as emotionally invested in the film I'm scoring as I am in writing a solo album - to me there's no difference or degrees in terms of how invested I am. The score of a film, whether it's ambient noise, a brass band or silence, is so integral to how an audience perceives what happens on the screen, but a lot of the time it has its effect without them ever noticing and in many ways that's why it's so powerful. JJ: I do think film music can be appreciated outside the context of the film itself, and indeed sometimes the music can transcend the film. Look at the dozens of amazingly beautiful scores written by Morricone in the 70s for forgettable films that few people remember today. You can draw parallels with classical ballet music and opera - the music can easily be appreciated outside of the context of the actual stage production.